I know this is primarily a software development blog, but sometimes the physical/hardware side catches my interest. Well, that’s what happened with lock-picking… I stumbled upon some old talks by Deviant Ollam about the subject and decided to give it a try. 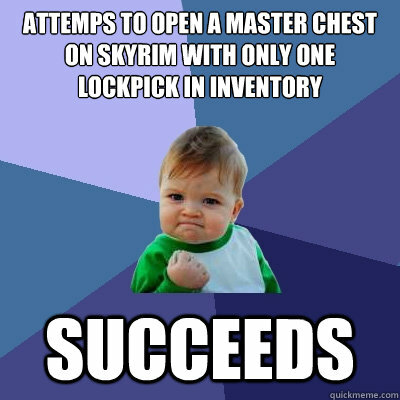 My first attempt was with a warded lock. The longest part of that was just finding/making the pick for it. It was fun learning about the history of that style and the pro’s and con’s of it. After that, I’ve just been working my way up the difficulty rating scale, using locks from Home Depot. It’s getting a bit expensive to do that, however, so I’ll probably move to just picking some up at garage sales or whatever if I see one I like. No one ever told me how addicting lock-picking would be. I sometimes catch myself sizing-up the locks I see throughout the day… Office buildings, especially, have plenty of interesting opportunities. Many businesses have RFID badges and whatnot for securing their doors and logging access, but the doors still have ‘legacy’ support for traditional keys (in case of power outages, for instance). If someone picks that lock open on one of those doors, how would your business know that someone was in their server room, HR department, or other sensitive area? This line of thinking eventually led me down the path of learning all about how master keys work and ways you can use legitimate access to one lock to eventually come up with your own master key for the other locks. That assumes the locks in your building even have a master key, but I imagine most do. That’s something I’d love to get a chance (and permission, obviously) to mess with sometime.